Good morning, it’s a nice day, isn’t it? Good afternoon, you look really nice today. Good afternoon, are you going to class? Good evening, do you want a cup of tea? Good evening, are you going to the party? Hello, long time no see, how have you been? 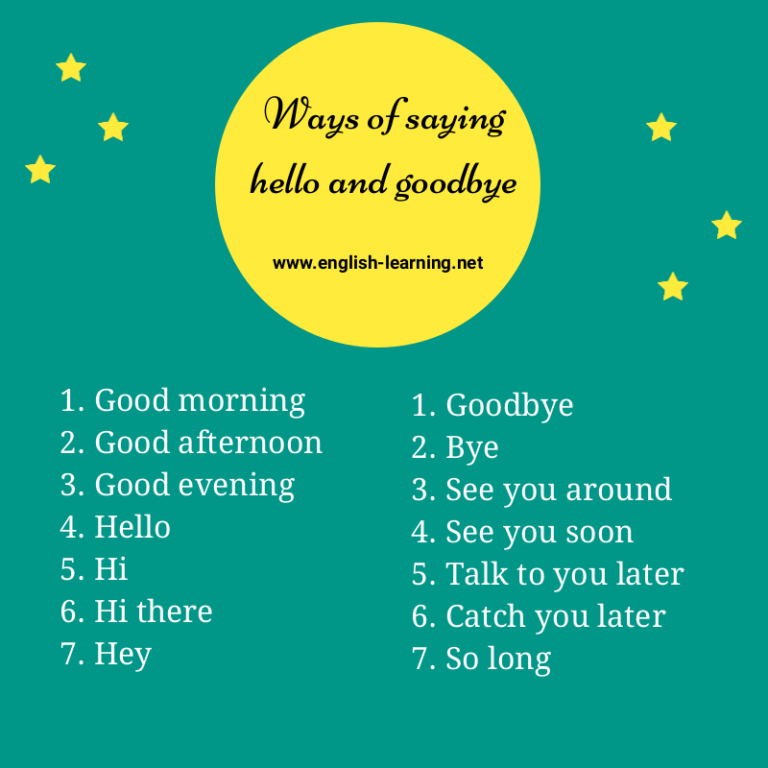 This is another way to say hello, it is used when you know the person quite well, or when you want to be friendly. Hi. You’re busy now? Do you want some coffee? This is the same as “hi”. Use it when you talk to friends or people you know well. Hey guys, what are you watching? And now, let’s discover different ways to say goodbye to people. Hey Rob, I have to go now. Goodbye! I’m sorry, I guess it’s time to go. Goodbye! Hey guys, I’ve got something to do now. Bye bye! Julie, remember to call me tonight. Bye bye! This is a cool way to say “goodbye”, you wish people a nice day. My sister is waiting. I have to leave now. Have a nice day! Oops, the class will start in 5 minutes. I e have to go. Have a nice day! Say this in the evening (should be after 9 p.m, I think), when you finish your conversation. Good night sweetheart, I’ll see you tomorrow. I will send a text when I get home. Good night! Kevin, thank you for the dinner. See you around! It’s great meeting you today. See you around!